This 9 ball trick shot is similar to Easy As 123 but with just a slightly different slant to it. One definite similarity is that balls must be tightly frozen together in order for the trick to work successfully. 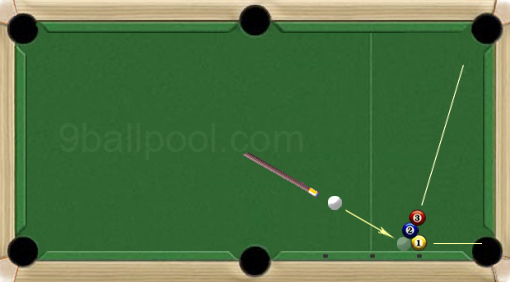 It should be obvious from the graphic above that the 2 ball and the 3 ball need to be aligned accurately with the opposite corner pocket and more particularly to the left side of it.